What could be more quintessentially American -- or should I say, quintessential to the American childhood experience -- than "Mac (Macaroni) & Cheese"?! The good news is that this recipe has far less butter than most existing recipes out there, just a hint for flavor -- and there's absolutely NO cream or flabby, rubbery-tasting slices of processed American cheese, etc. -- so it's a LOT healthier, (not to mention MUCH better-tasting! ), than most versions that rely heavily on these ingredients. It still tastes incredibly rich & creamy. I know, hard to believe, but I swear, it's true. :) Also, the sauce has a surprisingly thick consistency. A lot of "health food" recipes I've seen out there seem to rely on ingredients like cottage cheese or use all skim milk -- The first seems like it'd make the sauce too lumpy while the latter by itself probably isn't going to make the sauce thick enough. The secret to this recipe's sauce is the addition of a bit of flour, which acts as a very effective thickening agent. There's also a pinch of mustard in there too. Sounds strange, I know, but it really does enhance the flavor considerably. I was really pleased with how this recipe turned out. Hope you will be too! Directions: Bring lightly salted water to a rolling boil in a medium-sized pot. Add pasta & cook until al dente, about 9-11 minutes. While pasta is cooking, make the topping: Melt butter in a nonstick sauté pan on medium heat. Add Asiago & let it melt for about 30-60 seconds. Turn up heat to medium-high & then add bread crumbs & brown, about 5-7 minutes. Remove from heat & set aside. Drain pasta well & set aside. Next, make sauce: In the same pot used to boil the pasta, melt butter & rapidly whisk in flour, until the mixture forms a light roux. Then immediately turn down heat to medium-low. Keep whisking at a brisk pace, adding milk & creamer, & then cheddar. Whisk until melted & then remove from heat. Stir in all dry spices/herbs, add in pasta & gently stir to combine. Then transfer pasta mixture to a small, heat proof casserole dish, using a heat-proof spatula to scoop out the rest of the cheese sauce from the pot. 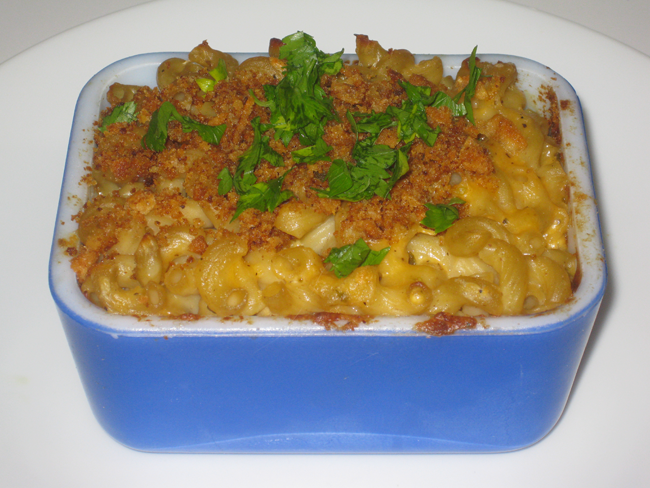 Top with bread crumbs & bake for 25-30 minutes on 375°F, or until topping has adequately browned. (Optional: Season with a dash of paprika & garnish with a sprig of parsley or some chives.) Serve & enjoy! Other ideas include using multicolored pasta or adding vegetables for nutritional value: halved cherry or grape tomatoes, broccoli, cauliflower, mushrooms, olives, red bell pepper, zucchini, asparagus, butternut squash, etc. (Just toss in the vegetables when you're baking the macaroni in the oven.) If you use the butternut squash, you might be able to get away with skipping the step of making the roux, since butternut squash is extremely creamy in its own right. You could also try some additional spices like marjoram, fresh sage, &/or fresh rosemary. Or, bring on the heat with some red pepper flakes, ground cayenne pepper, or jalapeños. You could also try substituting low-fat buttermilk, part-skim nonfat ricotta, &/or nonfat Greek yoghurt for either some or all of the creamer &/or milk. 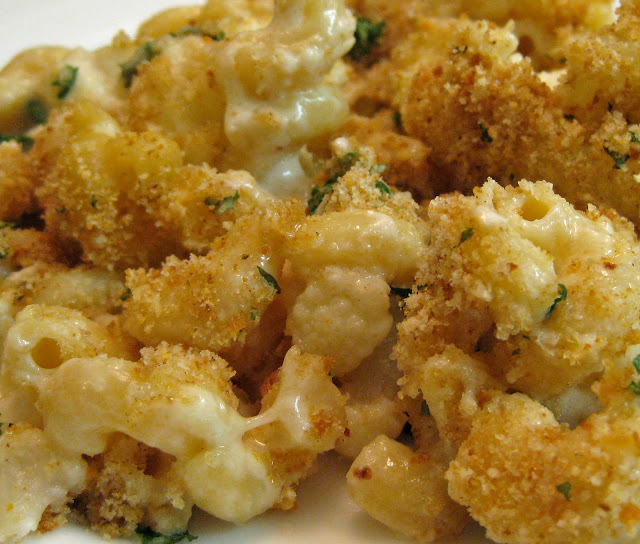 Alternatively, try using a different kind of lowfat cheese like Monterey (Pepper) Jack, mozarella, feta cheese, etc. Or, for a vegan version, try substituting low-fat soy milk or tofu for the roux, milk, & creamer, & soy cheese for the cheddar. This recipe is lovely! Really looks so delicious. I like the twist on it.